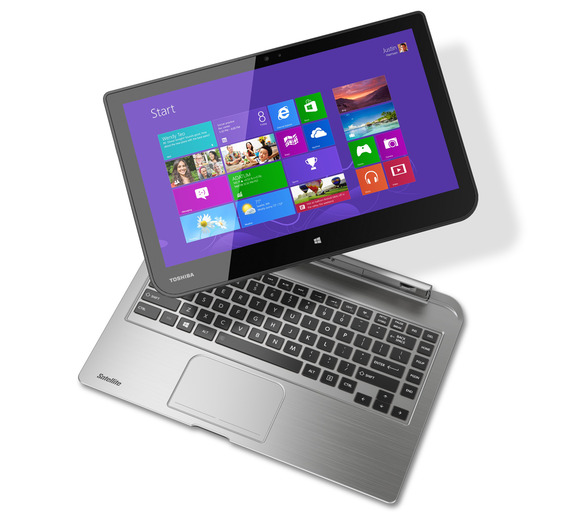 Toshiba took the wraps off a new Windows 8.1 tablet and two new Windows laptops at IFA Berlin today. Toshiba is tapping two CPUs from Intel's all-new Bay Trail family—the Celeron N2810 and an unspecified Atom processor—as well as a low-cost chip from AMD's new Temash family of APUs. Toshiba’s Satellite Encore is an eight-inch touchscreen tablet with a resolution of 1280 by 800 pixels. It's powered by an Intel Bay Trail Atom processor, 2GB of memory, and 32GB of storage. It can support an additional 32GB of storage via its MicroSD slot. 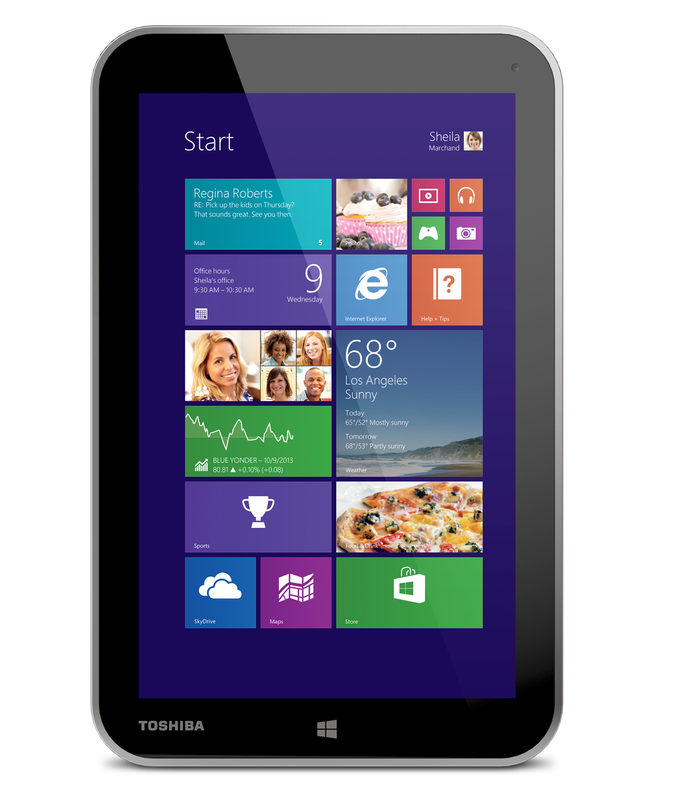 Toshiba's new eight-inch Encore tablet uses a new Bay Trail Atom processor, which is based on Intel's Silvermont microarchitecture. The Encore will feature a 2-megapixel front-facing camera, an 8-megapixel rear-facing camera, a dual-array beam-forming microphone, and Dolby Digital audio technology with dialogue enhancement. It will be Skype certified and ship with the full version of Microsoft’s Office Home & Student 2013. The Encore will support Windows 8.1’s InstantGo technology, so that the tablet will receive a constant data feed (email, app, and tile updates) even while asleep. It will resume from sleep in less than 300 milliseconds. The Encore will run Microsoft's Windows 8.1 operating system. The Encore can also operate as a secondary screen for the Xbox One, tapping Microsoft’s Xbox SmartGlass technology. The tablet measures 0.42 inches thick and weighs 16.9 ounces. According to Bae, the Satellite Encore “will be available in November, hot on the heels of Windows 8.1.” Toshiba has priced the tablet at $330. Bae described the Satellite Click detachable PC as a “productivity machine when docked to its keyboard that behaves like a tablet when detached.” The two-piece unit runs Windows 8 and consists of an 13.3-inch, multi-touch IPS display that functions as a tablet on its own, or as a notebook when docked to its keyboard. The new Satellite Click can operate as either a 13.3-inch tablet or a conventional notebook. The Click is powered by a dual-core AMD A4 processor (from AMD’s new Temash family), 4GB of DDR3/1600 memory, and a 500GB mechanical hard drive. 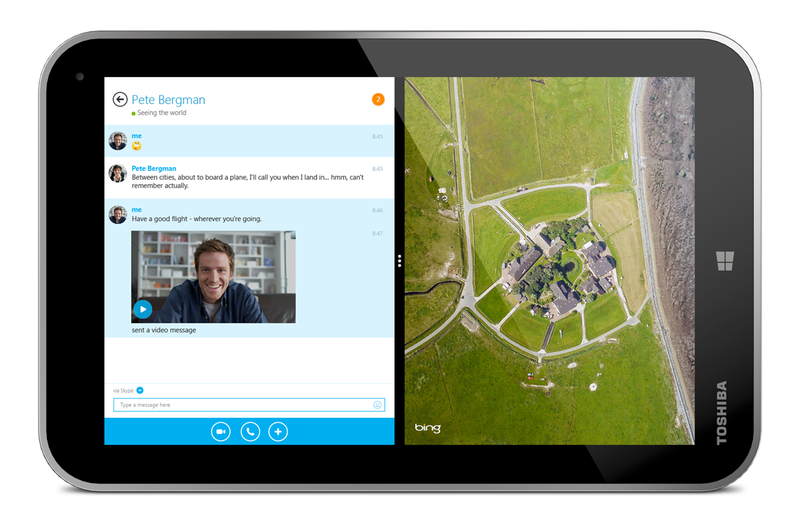 The tablet portion of the combo will also feature a built-in webcam, gyroscope, and accelerometer. The I/O ports include micro HDMI and micro USB. The keyboard dock will have a full-size USB 3.0 port and its own battery. When the combo is plugged into an AC adapter, the tablet will be charged first. When the two units are docked and operating on battery power, the keyboard will continuously charge the tablet. The keyboard also offers Toshiba's USB Sleep & Charge technology and will be able to charge a USB device even when the system is otherwise sleeping. The $599 Satellite Click will go on sale at Best Buy and Toshiba Direct later this month. Could we be seeing the resurgence of the netbook? The $380 Satellite ND15t will use a new Celeron N2810 dual-core processor, which—like the Atom in the aforementioned Toshiba Encore—is a member of Intel’s new Bay Trail family of processors. 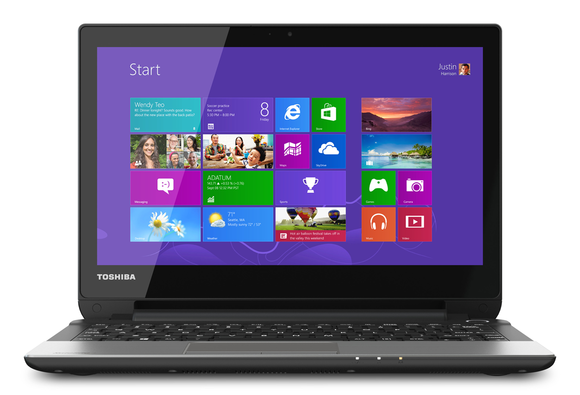 Toshiba is going after the Chromebook market with this very inexpensive Windows laptop. During last week’s briefing, Bae said the new Celeron delivers 1.5 times the performance of performance of Intel’s older Cedar Trail processors, and 3 times better graphics performance. The “clutch-sized,” 3.3-pound notebook will have an 11.6-inch touchscreen, HDMI, USB 3.0, and an 802.11n Wi-Fi adapter. “The ND15t is another option for value-minded consumers,” said Bae, “a more useful alternative to Chromebooks, with 500GB of local storage and Windows 8.” Toshiba expects the ND15t to be available in November.